The Daily Clog » Staring into an artificial sun: Not such a great idea? The application f.lux is designed to alleviate those problems. 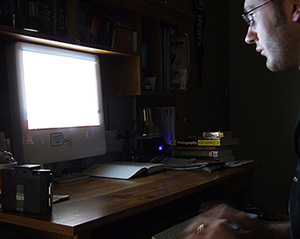 It changes the color of your monitor depending on the time, from bright in the day to warm at night. The degree and rate of the color shift can be modified for both day and night. It can also be disabled at any time for those art projects that require accurate color display. It is quite nice on the eyes – especially for those of us whose eyes are sensitive – and only takes up about as much memory as the Adobe Flash plugin to run in the background. To keep your eyes healthy and improve sleep habits, it’s worth it.